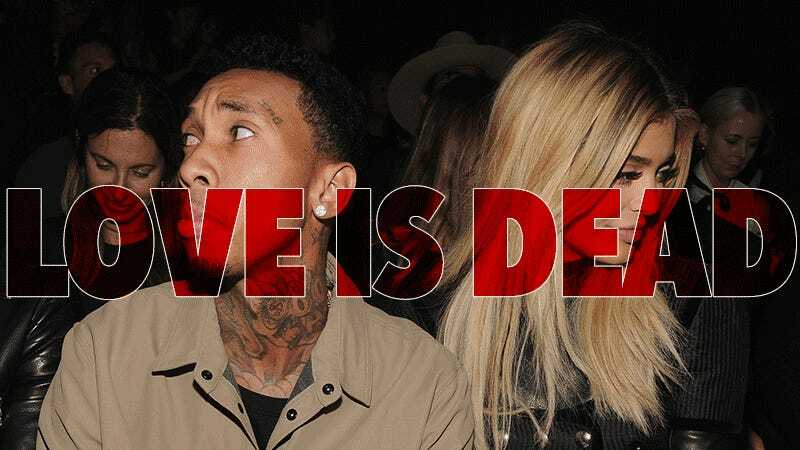 Style icon and app developer Kylie Jenner has reportedly broken up with her boyfriend, an aspiring rapper named Tyga who is frequently Snapchatted by Kylie in her Calabasas home. A promo for the current season of Keeping Up with the Kardashians, the popular docuseries on which Ms. Jenner’s talents were revealed to the world, suggested things might be on the rocks for the previously happy couple, and Friday’s multiple reports—including one from noted anthropology network E!—have made it official: they are no longer stimulating each other. Us Weekly reports the couple appears to have spent Tuesday night dining “with 15 friends in the wine cellar of Philippe in NYC,” during which they probably fought over who would pay the bill (Kylie), who would request the Uber home (Kylie), whose room they would be staying in that night (Kylie’s), or something entirely different (Kris). Kylie then traveled to Australia, presumably to discuss the future of her app, and returned to the states on Thursday, Tyga’s 26th birthday, after which she promptly broke up with him. A source says the unfortunate uncoupling was due to “something Tyga did,” but there’s no word yet on who that particular something is.